American Sports in Europe: At Bat is unable to reliably verify your location. Tap Help below for more information about blackout restrictions. At Bat is unable to reliably verify your location. Tap Help below for more information about blackout restrictions. One of the greatest solutions to the problem of watching west coast and night MLB on European time has been the MLB At Bat app alongside a MLB.tv subscription and a tablet such as my 7" Samsung Galaxy Tab. I can cuddle in bed at 4am in the morning and check the score, watch an inning or two, or if it's a fairly interesting match-up or close game I can stick around until the end. If my eyes are too tired to watch I can also just turn on KNBR instead and listen to the game. Everything was going fine until June 29th when I tuned in to watch the SF Giants vs. Reds game, the app requested to install the latest update. OK sure, why not? I got the error message, "At Bat is unable to reliably verify your location. Tap Help below for more information about blackout restrictions." What is this? As a small spell of panic made waves through my body, I quickly checked that my tab was allowing itself to detect location based on WI-FI and/or mobile networks. Correct, I haven't changed anything there. I even stepped out onto the balcony and acquired a GPS signal to double check. Yes I am still in Vienna, Austria... impervious to any blackout restrictions. I tried to access the video again and I still received the error message, "At Bat is unable to reliably verify your location. Tap Help below for more information about blackout restrictions." What have I done? I tried rebooting the tab. Nope. I unistalled the app and re-installed it fresh from the store. Nope. Nada. Zilch. Nothing. 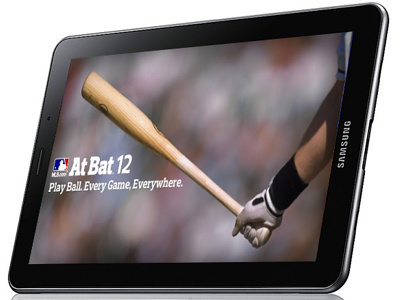 MLB.tv still works fine on my Galaxy S with the same version of Froyo 2.2 so it cannot be my location or Android OS. After doing some searching on Google I found that the Google Play store review section is chalked full of disgruntled people looking for a forum to vent. I also found some answers and a fix by MLB (albeit hidden on the internet). In order to address the situation of “location spoofing” to circumvent blackout restrictions, a new release will be distributed prior to tonight’s games. At Bat 2012 will now pop-up the following message if it cannot verify a handset’s location during the blackout check due to spoofing or incorrect settings. The application should work successfully after making these changes. Thanks! That was so helpful!!! on note 5 with marshmallow and it doesn't work.